Somewhere between our imagination, truth and the others’ desires we move, in different paths, towards the 'Macedonia of our dreams'. 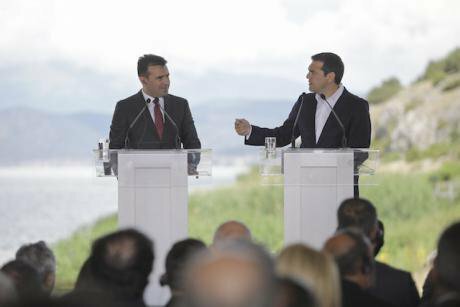 PRESPES, June 17, 2018 – Greece and the Former Yugoslav Republic of Macedonia (FYROM) sealed a historic agreement. Dimitris Tosidis/ Press Association. All rights reserved. The historic Agreement of June 17 2018, signed in the Prespes lakes between Greece and the Former Yugoslav Republic of Macedonia (FYROM) brings to an end an international dispute festering for 25 years. The agreement ensures a peaceful future of solidarity and shared economic development for the two peoples and the Balkans more generally. It provides that the new name of FYROM will be compound with a geographical designation ("North Macedonia"). It will be applied both domestically and internationally (erga omnes), and the constitution of FYROM will be amended accordingly. The agreement defines with clarity the political, historical and cultural boundaries between Greek Macedonia and North Macedonia. Its completion depends on a number of steps. FYROM will have a referendum in the autumn. If the citizens approve the agreement the constitution will have to be amended. A two-third parliamentary majority is required for that and currently the pro-agreement parties do not have it. If these prerequisites are met north of the border, the Greek parliament will have to ratify the agreement. Independent Greeks, the minor partner in the coalition government, are resolutely against it. The agreement’s passage is therefore littered with hurdles. However the expectation on both sides is that this almost impossible mission will be completed in the first part of next year. The agreement respects the dignity and the right to self-determination of North Macedonians. It accepts the existence of a Macedonian language, part of the Slavic family of languages (a fact long recognized by the UN and Greece but disputed by the Greek nationalists who see “irredentist” claims in it), and designates the nationality as Macedonian/Citizens of North Macedonia. The agreement shows that respect for the identity of people is the only way to confront nationalism. The agreement shows that respect for the identity of people is the only way to confront nationalism The heated debate on the “Macedonian” issue during the negotiations and after the conclusion of the agreement in June helps us understand the contemporary work of ideology. Various arguments have been mobilised by the opposing sides in Greece: the term ‘Macedonia’ refers either to the history and tradition of the area and therefore is exclusively Greek or it is a geographical designation in which case the larger part of the Macedonian region lies in Greece, some 40% in FYROM and a small part in Bulgaria. Macedonia is either exclusively Greek or a designation that belongs to other people too. The people of ‘Macedonia’ are either a nation or a non-ethnic population. Macedonia has an independent language or is a dialect of Bulgarian; it is a geographical region or an independent state. And this is only what is argued about in Greece. It is clear that the meaning of the term ‘Macedonia’ is seriously contested. Furthermore, our conception of what constitutes a ‘nation’ is rather ambiguous. This kernel of individual and collective identity remains clouded and largely unknown. Nevertheless, we are determined to mobilize, to participate in rallies and protests, to fight each other without fully knowing what is at stake. In Greece, the nationalists threaten SYRIZA Ministers and MPs who support the agreement – some have received death threats; they try to break up meetings explaining the issues and have tried to derail the agreement. In FYROM, the opposition has similarly supported rallies opposing the agreement and has brought a prosecution against pro-agreement Ministers and MPs for high treason. The Greek nationalists do not want the northern neighbors to use any form of the word ‘Macedonia’ in their name; their FYROM opposites do not want the designation ‘Northern’ next to their name. As is often the case with opposed nationalisms they are the two sides of the same coin. What is unique about the agreement is that an issue of contested identity, so common in multiculturalist societies, has become an international dispute and has been resolved through a legally binding international agreement. In Macedonia, identity politics has entered the hackneyed world of international realpolitic. In Macedonia, identity politics has entered the hackneyed world of international realpolitic. How does ideology reconcile these sharply opposed juxtapositions? Ideology operates between knowledge and the unconscious, between things that we are certain about, and mysterious others we don’t fully understand although they determine us. Our actions are often led by desire, trauma and fear. The ‘Macedonian’ politics of the right-wing is exemplary. Many rejectionists, particularly those who have lived overseas or have knowledge of diplomatic life, acknowledge in private and occasionally in public that a window of opportunity exists to solve a problem that seemed insoluble. They agree that this must be done soon because the “wound” of the missing name festers and both countries have lost a lot by acting intransigently. Greece will gain from the agreement. One hundred and forty states, including the US, Russia and China, have recognised FYROM with its constitutional name “Republic of Macedonia”. The Greek claim that ‘Macedonia’ refers exclusively to classical antiquity is daily denied in international fora and media, which use the constitutional name. I recall that the incomprehensible Greek denial of the name used by everyone in academic conferences raised eyebrows and ironic comments. The compound name with the geographical designation will therefore deter FYROM’s nationalists’ fake claims to a millennia-old history and tradition. Our neighbours gain even more: they will stop being outcasts in the international community on account of the Greek veto of their name. The stability of the state will be guaranteed, applications to join NATO and the EU will go ahead, securing the future stability and prosperity of the region. The agreement is the definition of a win-win situation. However, the right-wing unconscious, traumatized by the loss of power to the “sans culottes” of the radical left, acts against logic. Its most important desire is to get rid of the government and return power to its “legal owners” who ruled the country for forty years, bankrupted it and brought it to its knees in 2010. Returning to a state of dynastic and political normality is much more important than the national interest. The position realised in the Prespes agreement (compound name erga omnes and constitutional amendment) was devised by the right-wing government of PM Kostas Karamanlis in 2008 and has become known ever since as the “national” position on the issue. However, despite the origins and ownership of the government’s position, the right-wingers have rejected the agreement and attacked the government, doing whatever they can to prevent an agreement and, after it was signed, to scupper it by overthrowing the government. The negative geopolitical and economic effects of failure are well known, but do not stop the rejectionism of politicians and commentators. It is a good example of the irrational logic of the unconscious: “I know well that my actions will harm the country and its interests however I still go ahead and carry them out”. The behaviour of the Greek Communist Party is not dissimilar. Its deputies keep repeating dogmatic and simplistic axioms about the evils of imperialism and capitalism. They supposedly support working-class interests but, at the same time, they criticise governmental policies supporting the poor, thus undermining their claim to stand for the underprivileged. Ideology is no longer the classical Marxism’s “false consciousness”. Politicians are well aware that their actions contradict their knowledge: but this does not stop them. Ours is an “enlightened” false consciousness: politicians build a protective buffer zone around them, which deflects what they know but cannot accept. Ideology recognises its mistakes but its cordon sanitaire rebuffs all criticism. Politicians know that they act against their interests and principles. They go ahead and do it nonetheless. These contradictions replace ideological conflict with cynicism and hypocrisy. Its signs are everywhere. Politicians deny that their actions are hypocritical but blame all others for delusions and lies. Their beliefs are solid, their ideas real: their opponents’ habitually wrong. The claim that we have truth on our side is the most powerful ideology in our post-ideological era. This applies equally to those who rely on their “indisputable” knowledge as well as to the others who follow their emotions. How? Desire is the desire of the other: our emotions are triggered by reciprocal relationships with others. I have strong feelings, I believe something passionately, when I know that others believe or desire it. Many Greeks don’t understand the words of the liturgy, for example, because ecclesiastical language is archaic. Yet since a priest speaks them in a church service we are prepared to believe them. Church sacraments (called “mysteries” in Greek) are linguistic mysteries too. The priest knows their meaning and that is enough for the churchgoers. Similarly, technical macroeconomic or financial analyses about the crisis or the debt are incomprehensible to most. But if economists understand them, we believe them without enquiring further. What matters is that some people – politicians, scientists, experts – know the answers, even though they disagree amongst themselves. In a society of constant information flows, we empower other people to believe for us. The more our societies collect data and information, the more our personal ignorance grows, accompanied by our trust and support of the few elect. We believe by proxy. The more our societies collect data and information, the more our personal ignorance grows, accompanied by our trust and support of the few elect. We believe by proxy. The combination of cynicism and claims to truth is the dominant ideology of our post-ideological era. Although I don't really believe anything besides my interest, I feign belief in what others believe and place my faith in them. Like car or white goods dealerships, representatives of ideas tell me what to believe. When I see someone laughing or crying, I laugh or cry with them. Similarly, when others repeat an argument, I accept it so that I can both believe and have utter ignorance about the matter. Post-ideology is constructed around empty signifiers such as ‘Macedonia’ or ‘nation’. They signify different things to different of people. Since it is not possible to describe or define them irrefutably, every group attributes to them its own preferences, trying to attach a signified to the empty – or full – meaning of the word. The polysemy of these words turns them into an ideal bedrock for individual and collective identity-formation. As it is impossible to define them linguistically, we refer to them through significant events or images. “In order to understand the meaning of Macedonia, you should have taken part in the anti-agreement rally”, people say. Or we show an image: the Sun of Vergina (an archeological find linking the site of Vergina in Greek Macedonia to classical Greece), Alexander the Great’s statue, the national flag or the memorial to the unknown soldier. None of this explains what Macedonia is. But they bring to mind more images of joy, exaltation, emotional engagement: the Parthenon, some other hero’s statue, the celebrations for winning the 2004 European championship, the emblem of your football team. Their combination creates a constellation of affects that gives an emotional meaning to Macedonia. It is uninterested in detailed historical, geographical or geopolitical arguments but it is much stronger than them. We could list similar symbols and images that have influenced the BREXIT referendum and subsequent debate. The psychological architecture built around words and images is part of our individual and collective struggle for recognition. The others’ desire constitutes our identity in recognition or misrecognition of its components. We are never certain about the meaning of symbols or about the solidity of our individual or collective identity. Psychoanalysis emphasises therefore the role of others in this struggle and distinguishes between two types of organising our response, the “ideal ego” and the “ego ideal”. Ideal ego: the individual imaginary, with its images and imagination, projects an ideal identity and compensates for the “lack”, the Freudian discontent of everyday failures and disappointments. On Macedonia, I am informed, educated, tolerant despite the difficulties of everyday life. Commitment to knowledge and values guarantee my intellectual superiority. On Macedonia, I am informed, educated, tolerant despite the difficulties of everyday life. Commitment to knowledge and values guarantee my intellectual superiority. The collective imaginary, on the other hand, projects a national glorious history and a bright future. “Macedonia”, Alexander the Great, the Balkan wars victories become aspects of my knowledge and scientific understanding – and I am for the agreement - or for my national myth, tradition and culture – or I am against it. Either way, these collective imaginaries compensate for national humiliations, the impoverishment of people, the limitations of sovereignty. Ego ideal: I see myself from the other’s position and try to become or do what the other expects from me. This is the meaning of the anti-nationalist satisfaction with the huge international approval of the agreement and of the nationalist rallies against the agreement south and north. I become the same as others, I believe what they believe, I accept the narcissist’s desire who sees in others his own reflection. In the meantime, the widest possible acceptance of the Prespes agreement is the best way to start building a Balkans of friendship and peace, no mean achievement if you recall that less than thirty years ago deadly nationalist wars were killing and driving from their homes thousands of people.